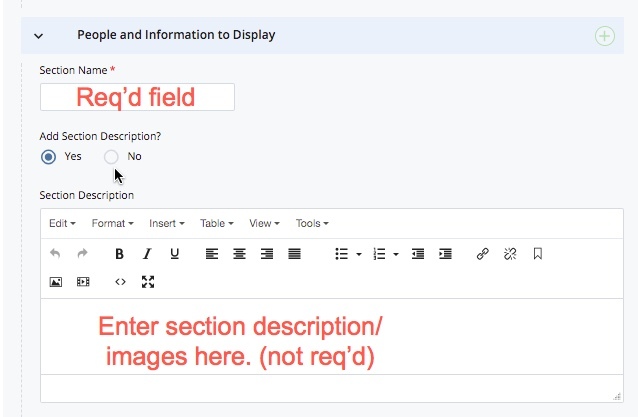 As mentioned on the main instructional page, you have the ability to create sections on your page. You can create multiple sections and sub-sections. If you wish to organize people into separate sections, set the Page Layout area option Organize People Into Separate Sections to Yes (by default it is set to No). When you set the Organize People Into Separate Sections option to Yes, there will be an option to Display Sections with Collapsible/Expandable Content Boxes. When this option is set to Yes (in the Page Layout area), the published page will collapse all sections by default. To expand a section (and its related directory content and any subsections), click on the Section Name. To collapse an expanded section, click on the Section Name. When you refresh the published page, all sections will be collapsed so only the section name(s) will display. When you set the Organize People Into Separate Sections option to Yes, the Section Name field appears in the People and Information to Display area (it is a required field). When you add a section, each section will be numbered. If you have three sections, they will be numbered 1/3, 2/3, 3/3 and so on. Use the plus, "x" and up and down arrows to add a section, remove a section or reorder them. By default, a section does not have sub-sections. To add a sub-section to a section, set the radio button to Yes. When set to Yes, a People and Information to Display area will appear for the sub-section. The Sub-Section Name is not required but can be useful. The Sub-Section description is also optional. 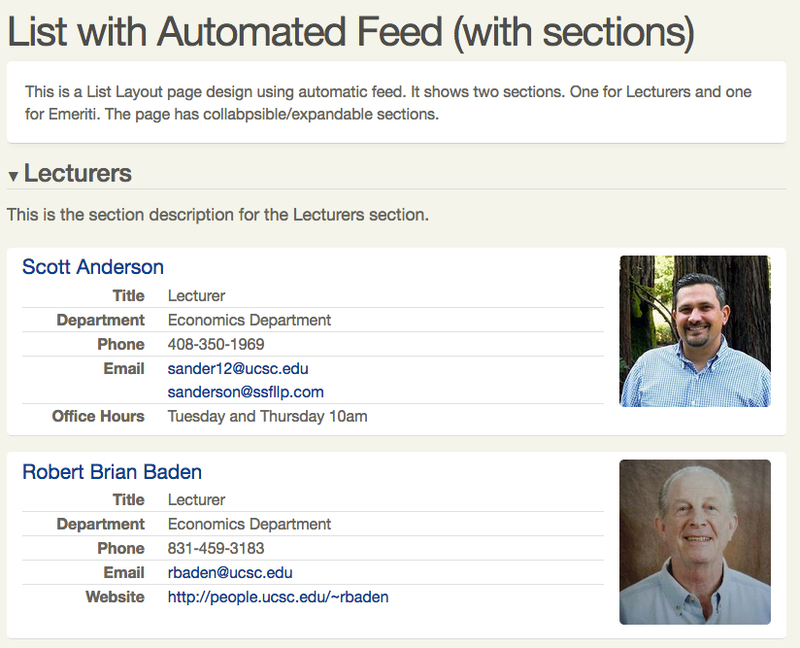 By default, each sub-section will have the same fields as the section selected. 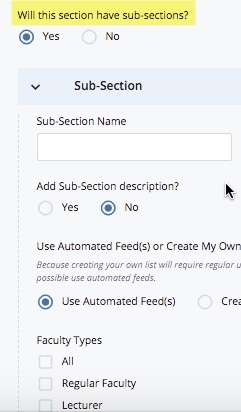 If you want a sub-section to have different fields displayed, set the Display Different Data for this Sub-Section to Yes. Select the information to display checkboxes as desired.